After writing the blog post on How to Use Color in Marketing, I had several people ask me if I knew anything about selecting the right colors for the interior of their home. Yes, I do! And Yes, you can improve the vibe of your home by just understanding the symbolism of each room and the psychological affect of color. The lowdown....The colors you choose to paint each room in your home shapes the personality—the energy—of the room. Those colors reinforce a message about you to whoever visits that room. Below are descriptions of what each room symbolizes in your house along with the colors that work better in the room. In reading the descriptions below, think about the personality you have given each room in your own house. Are the colors you’ve chosen supporting the true purpose of the room, and for that matter, creating the energy flow that is in alignment with your personal goals? A bathroom symbolizes the need for cleansing, purging, or eliminating something in your life that isn't quite working. Time to release and let go. You want to be able to release in the bathroom. Cooler or more earthy colors support that. A kitchen represents that you are preparing yourself for something. It may also symbolize something you have brewing or cooking up such as an idea or concept. The kitchen is a social place. Many people are drawn to decorating their kitchens in yellow, orange and red tones which reinforces a social environment. However, those colors have also been found to increase hunger making people snack more often. Use those colors sparingly in your kitchen, and make sure you bring in some cooler tones to balance the room out. A dining room means its time to nourish and take care of you. This is where you actually do sit down and eat in your life. It’s where you fill your physical body with nourishment. It’s also a place for conversation and formal gatherings. Most dining rooms in a home sit empty the majority of the year. As a result, a dining room can be dressed up in colors that reflect a style that make your comfortable. My recommendation is to use earth tones or colors that are richer in nature. This can set the tone for a more royal festive occasion. The living room symbolizes being comfortable, relaxing, and taking a break. 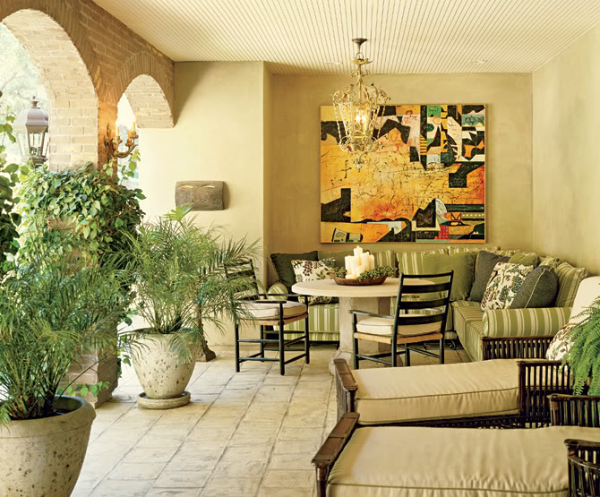 Greens, beige, tans and browns are colors that promote relaxation and make others comfortable when visiting. The bedroom is a place you go to rest and contemplate the day. It may even symbolize sexuality issues. This is the place where you can revive your energy and Spirit. Blue is the best color to paint a bedroom. It allows one to relax comfortably and confidently. Earth colors also provide a calming environment for one to be able to relax and obtain a good night’s sleep. A basement or cellar symbolizes your subconscious mind which deals with routines, habits, and patterns. It also involves eliminating outdated beliefs. Many people store their Christmas decorations, childhood memories, and junk in basements keeping the energy of old habits and secrets buried deep within your home. If you have a finished basement, bring some warm toned colors into it to liven and brighten it up.